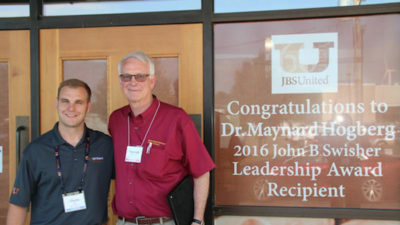 Dr. Maynard Hogberg, Professor Emeritus of Animal Science and former Animal Science Department Chair at Iowa State University, is a national leader in animal agriculture. As a professor at Iowa State, he has mentored countless students, faculty and colleagues. He served as a leader to multiple organizations including president of the American Society of Animal Science and of the Federation of Animal Science Societies. In 2007, Hogberg was named an Honorary Master Pork Producer by the Iowa Pork Producers Association. In 2009, he was awarded the Distinguished Service Award by the National Pedigreed Livestock Council. In 2014, Dr. Hogberg was presented with the Distinguished Service Award from the National Pork Board. Most recently, Hogberg led the establishment of the Jeff and Deb Hansen Agricultural Student Learning Center at Iowa State. As part of the honor, United Animal Health has contributed $5,000 to the Iowa State University Animal Science Department.